Note: We are thrilled to have Pamela Fallon Thornley as our Special Guest Blogger. You can follow Pam on Twitter at @fallonthornley. When I think of the year 1967, the first movie that comes to my mind is To Sir, With Love. It might not be everyone’s first choice, since it did not win Best Picture or any other Oscars, but that does not stop it from being an important movie for its time. It dealt with many issues relevant to the 1960’s, and it also had a very distinctive sixties look. I wasn’t alive in 1967, but this piece of that year, is very near and dear to my heart. The story, written by E.R. Braithwaite, and adapted for the screen by James Clavell, centers around the character Mark Thackeray, a man who, though educated as an engineer, has decided to accept an appointment as a teacher at a London school. The movie opens on his first day in this position, when he meets his fellow teachers, and more importantly the students that will be in his class. Being new to the teaching profession things, BIG SHOCK, didn’t go swimmingly at first. Like many movies dealing with the trials and tribulations of school life, the adolescents in this film are troubled, with many being just plain rebellious, which makes Mr. Thackeray’s job all that more challenging. Gradually, as he starts to find his own teaching style, and as his students begin to realize that he has their best interest at heart, things begin to improve. The school is full of teachers that have lost or never had the love for the profession. Mark Thackeray is a breath of fresh air in this stale and stagnate institution. Most of the students come from homes that lack discipline and structure, and they are in desperate need of a strong role model. He becomes this for them. By 1967 there had been countless movies about the relationships, and the interactions between teachers and their students. However, I feel that To Sir, With Love was able to take a fresh and positive spin on the storyline. The thing that made this movie unique, is the approach used to solve and defuse the problems at school. Mr. Thackeray talked to his students. Instead of just spouting off rules, he explained things to them. With this approach, an honest relationship blossoms between the teacher and students. Mark never talks down to them or treated them as if they were children. Instead, he expected them to act as adults, like the ones the world was soon expecting them to be. He taught them life skills,such as tips on cooking and hygiene to get them ready for the outside world. This is important, since the next stage in their lives is to go out into the work force. No topic was forbidden, which helped to get his students to open up, and the teenagers really respected him for it. For many of them having any respect for an adult was a big step just in itself. He did set some ground rules for his class, but only in that he expected them to show him and their fellow class mates due respect, to be clean, and not to use foul language. Students were to address each other as Miss or Mr, and they were to address him as either Mr. Thackeray, or Sir. You can guess which one they preferred. As their teacher there were many times Sir, was called on to give advice, and to help his students with personal issues. Some were on a one on one bases like when Mrs. Dare asked him to talk to her daughter, Pam about being out late at night. Pam is very hurt because she feels her behaviour is justified, and she doesn’t understand him talking to her on her mother’s behalf, “Why are you taking her side?”. Her hurt is intensified because she has been one of his biggest supporters, and also because of the very thinly veiled crush she has on Mr. Thackeray. They do manage to work through this bump in their relationship, and come to an understanding where they have mutual respect for each other. An issue of great significance that was dealt with in Sir’s classroom was racism. Racism is still a big issue today, but back in 1967 during the civil rights movement it was very much a hot topic. This issue is skirted around during most of the movie but is discussed seriously after a boy in the class, Seales, loses his mother. The students wanted to do something for their classmate, and friend because of his mother’s death, but because his family is black the students feel it will look bad if they are seen going to his house. They try to explain that they don’t feel any malice towards him or his family, but as Babs (Miss Pegg) says, “You can´t imagine the things be said.” It is at this time that Mr. Thackeray teaches them not so much in words as much by his own actions that in the case of racism doing nothing when you know it is wrong is the worse way to handle it. They are part of the generation that if they feel something is unjust they need to be the ones to change it. Keeping quiet is no longer acceptable, the way to show people that racism is wrong is through their own actions. In the end, they all take the flowers to Seales’ house. It is a simple gesture, but it is a victory on so many levels, and that the students might not even realize it. It shows changes in a positive direction, and increasing maturity by the students. They are starting to act as responsible adults. The appropriate way to describe the style of the movie, in simple terms is that it seemed real and authentic which was becoming more common place in the sixties. The movie directed by James Clavell, takes place in the London’s poor East End in the sixties,and was filmed on location in London. The constant use of exterior scenes on real London streets help makes one unquestionably feel like that is exactly where you are.. The school scenes might have been done on a sound stage, but if that is the case, the transition certainly wasn’t noticeable, and they did a very convincing job of replicating a realistic school interior. The building looked dilapidated, and seemed in desperate need of repairs and renovation. The class rooms, gym and teacher’s lounge are all dreary and drab with outdated furnishings and equipment. 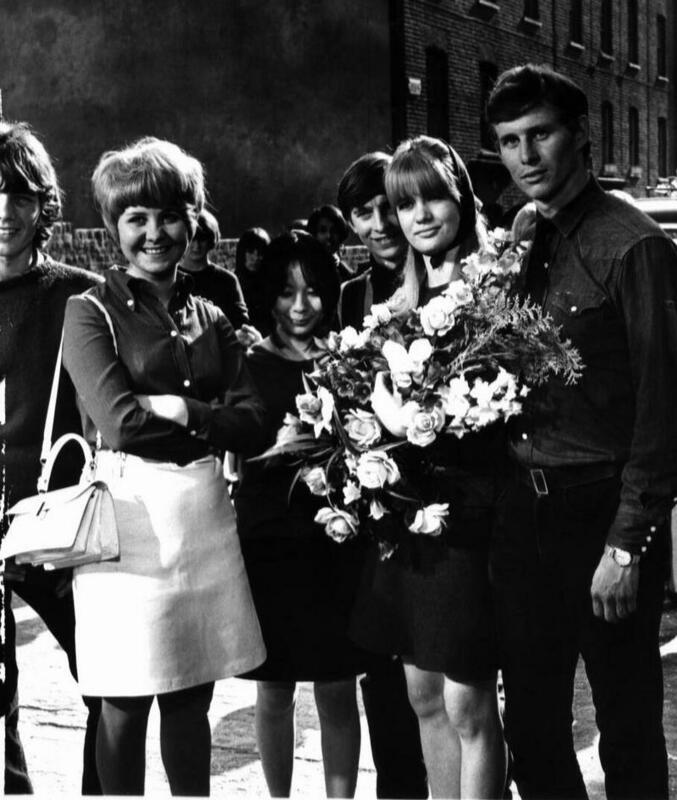 The wardrobe and hairstyles for the movie captured the look for the late sixties perfectly. Perfectly in that it captured the popular style of 1967, but with the use of natural light, and minimal use of filters in no way did the characters have flawless appearances. The clothes though the proper style were not tailored, the mini skirts and dresses didn’t look new and even gave the appearance that they might have been purchased at a discount store. This realistic feel also held true with the hairstyles and makeup. The cast was filled with women sporting over teased locks, and men with hair long enough that they could have been mistaken for one of the girls. However, none of it had that Hollywood glitz and glamour look to it. Make up also didn’t look professionally done, and stayed with minimal application of lipstick, blush & eyeliner on the actresses. I’m not saying any of it looked bad, I’m just saying that all the looks shown in the movie could easily be achieved, and gave the characters the feel of being real people. This helps to make the characters more relatable by the viewers. Not only do they respect and admire Mr. Thackeray, they want to say it out loud. The song is actually played one more time during the ending credits. At this final part of the movie Mr. Thackeray has a tough decision about which path he should take with his career. The song playing, hints to us that his students helped him to make his decision. I’ve talked about the movie To Sir, With Love from an analytical point of view, but I haven’t yet explained why it is near and dear to me. Well to start it has the rare distinction of being one of the few times my mother suggested a movie to me. I’m not saying that she ever really hindered my love of movies, but I can’t really say that we bonded over them. We have gotten better over the years, but still I am mainly her go to when she needs a title for her crossword, or in someway needs to use my knowledge of films. This wasn’t the case one Sunday night in 1987. My mother announces that we need to have dinner early because she saw in the listing that a movie that she loves is going to be playing on the movie channel. She says that it is called To Sir, With Love, but at this time the title really didn’t mean anything to me. I didn’t go into it overly excited or with much enthusiasm, but I did agree to sit down to watch. Well, when the ending credits played and the title song plays for the final time this ho hum view had changed. No, it wasn’t because there was a main character named Pamela, though I did like that fact. The best way to explain the change in my reaction is to say “Sidney Poitier!!! 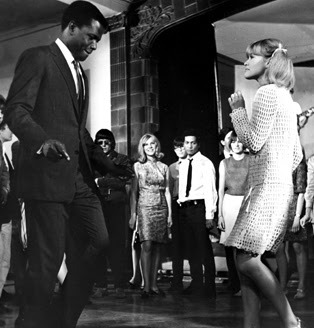 !” It also starred Christian Roberts, Judy Geeson, Suzy Kendall, a really young Michael Des Barres, and the singer Lulu in her first movie role, but it was Sidney Poitier that made the movie for me. To say I was blown away by his charismatic performance is an understatement. The power of very good casting. I only wish I was one for keeping a diary, because I would love to read precisely what my first thoughts were of his performance. 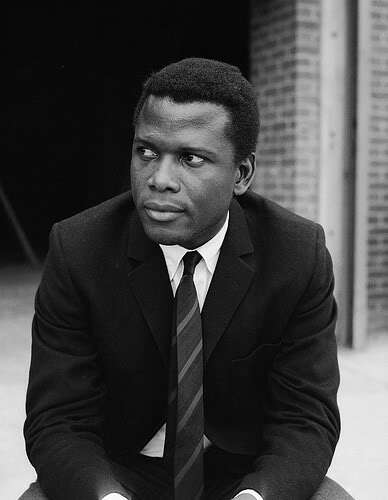 One thing is for sure, is that, if I had written in a journal, I’m pretty sure one of the first entries about Sidney Poitier would have started with “Oh My God, He is Gorgeous!!!! !” I should clarify that I was also very much impressed with his acting. His looks were just a plus. This movie set me on the path of a “slight” Sidney Poitier obsession where I wanted to learn everything about him, and to watch all of his films. Just so you know, his other films that I was able to find didn’t disappoint either, but To Sir, With Love is still my favourite. All this talking about To Sir, With Love is making me realize that I haven’t watched it in awhile, at least a few months. Well, I better go fix that right a way. Until I can get to my DVD player I think I will listen to the song To Sir, With Love sung by Lulu. It never fails to put a smile on my face. I hope others will take my lead, and go experience it all as well. You can follow Pam on Twitter @fallonthornley. 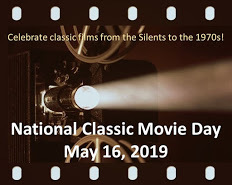 This post is part of the 1967 IN FILM Blogathon hosted by Silver Screenings and The Rosebud Cinema. Click HERE for a list of contributions. Loved the story about your mom suggesting that first viewing. I also got a kick out of your first reaction to Sidney Poitier. Just the other day my daughter walked through the living room and clips of young Sidney were on TCM. She paused, smiled and said “pretty!”. 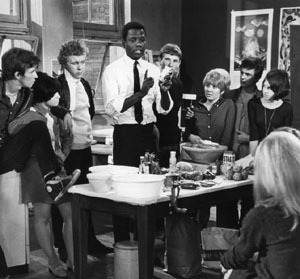 I know three teachers whose career inspiration came from watching “To Sir, With Love” in their impressionable youth. I’m sure there are many, many more. It is something everyone associated with the film can be proud of. Hey, how many “Star Wars” fans become Jedi Knights? Thank You for reading, and leaving a comment. It is great to think that this movie inspired people. Nice to think that this movie inspired people. Thank You for reading, and I appreciate your nice comments. One of my favorite films and much of that has to do with the well-defined relationship between Poitier’s teacher and his students. Plus, the title song is indeed terrific and Lulu sounded fabulous on it. I love the song too. It always makes me happy. This film is perfect! One of the things I’ve always appreciated is the authenticity, and I know my dad (who grew up in the same era, on the same streets) always felt like it captured a particular mood that was often overlooked by filmmakers. Thanks for inspiring me to watch this again! An excellent movie and I also recommend the book it was based on. Gives a bit more background to Sir’s life before he moved to London. Thanks for dropping by, Margaret. This really was an inspiring film, wasn’t it? I had heard of this film but never seen it so enjoyed reading about it. I especially found intriguing the part the music played in this movie and your analysis of it. Your description makes me want to see it, and I appreciate you taking so much time to write about it in detail. I hope you’re able to see it. It’s a gritty movie, but with an inspiring message. Sidney Poitier is absolutely fab in this role.